Director – John Carpenter, Screenplay – John Carpenter & Debra Hill, Story – Irwin Yablans, Producer – Debra Hill, Photography – Dean Cundey, Music – John Carpenter & Dan Wyman, Makeup – Erica Ulland, Production Design – Tommy Wallace. Production Company – Falcon International. At the age of six, Michael Myers is placed in an asylum after murdering his sister. Sixteen years later, he makes an escape. Pursued by his psychologist Dr Sam Loomis, Michael returns to his hometown of Haddonfield, Illinois on Halloween night where he stalks three babysitters, including Laurie Strode. In 1974, director John Carpenter emerged with Dark Star (1974), made while he was still only a student at USC, an hilariously snide take on the whole “boldly going” space exploration rhetoric of Star Trek (1966-9). Carpenter bummed around Hollywood for a time after, writing various scripts – most notably the thriller Eyes of Laura Mars (1978). He then made Assault on Precinct 13 (1976), a solid and gratifying low-budget thriller about a group of cops and prisoners holed in a police station against marauding street gangs. While Assault on Precinct 13 was not a major financial success, it gained John Carpenter critical acclaim as a director. Halloween was his next film and a massive success that consolidated his reputation. It was made on only a $320,000 budget and shot in 21 days; nevertheless it became one of the most successful low budget films ever made. And along with Friday the 13th (1980), it started the entire slasher craze of the 1980s. 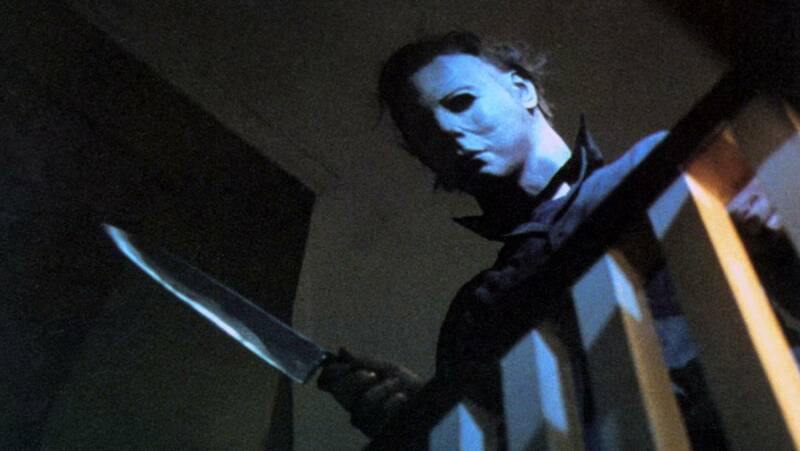 Halloween has little in the way of plot – it almost entirely consists of stalking scenes. John Carpenter pops uncanny you-thought-he-was-somewhere-else red herrings on the audience at the most unexpected moments. Michael Myers becomes like a jack-in-the-box pop-up effect – always behind people and then gone when they turn around. We are kept on a breathless edge, always waiting for something to pop around the edge of the frame and Carpenter perpetually surprises us, luring us with red herrings and then jolting us when we least expect it. Halloween is a classic of peripheral misdirection – there are few other films that seem to occur so much in the background or edge of the frame as this. A number of slasher films quickly copied these jumps and tactics, but few of them conduct them with the subtlety and finesse that John Carpenter does. The opening shot is one of the most classically stylish openings in any horror film – it consists of a single Panaglide sequence shot from Michael Myers’s point-of-view, circling the house, pulling a Halloween mask over the lens as he enters and then stabs his sister. The single-shot is finally broken with Carpenter pulling back as the parents arrive and the mask is removed to reveal with considerable shock a six-year old boy’s face beneath. Some of Carpenter’s other images are so weird and unearthly that the film almost takes on supernatural overtones – like the appearance of Michael Myers before P.J. Soles wearing a sheet and her boyfriend’s glasses over his head, or of Nancy Loomis’s body lying on a bed with a headstone, lit up by a flickering Halloween pumpkin placed above it. Carpenter, who also scores most of his films, creates the film’s memorable ta-tink-tink, ta-tink-tink motif, which adds great eerie atmosphere. A certain conservative morality lurks underneath the film. For one, there is Dr Loomis’s objectification of Michael Myers as ‘evil’. “I realised what lived behind that boys eyes was purely and simply evil,” Donald Pleasence says. Later he refers to Michael Myers as having ” … an emotionless face, Devil’s eyes …” Alas, ‘evil’ is the kind of term that any self-respecting psychiatrist tends to avoid – it is a moral term and serves no real usage in being able to explain behaviour. It is one that perhaps inadvertently makes Dr Loomis into somewhat of a crackpot as psychiatrists go, a characterisation that became much more evident in the later sequels. It also shows the increasing trend in psycho-thriller movies – subsequent entries such as The Silence of the Lambs (1991), Se7en (1995) and 8MM (1999) all being good examples – in seeing psychopathic behaviour not in terms of behavioural motivations but rather in moral terms, as being entirely on the other side of a dividing line that is removed from normal human behaviour. Halloween was copied by dozens of other films using similar holiday titles and featuring teenagers being stalked by masked maniacs. A sampling would include the likes of Friday the 13th (1980), Christmas Evil/You Better Watch Out (1980), Graduation Day (1981), Mother’s Day (1980), Prom Night (1980), Happy Birthday to Me (1981), Hell Night (1981), My Bloody Valentine (1981), New Year’s Evil (1981), Silent Night, Deadly Night (1984), April Fool’s Day (1986) and Rush Week (1989). Halloween contains many genre references to other films. The Thing from Another World (1951), which John Carpenter would later remake as The Thing (1982), appears on a tv at one point. Donald Pleasence’s psychiatrist is named Sam Loomis – also the name of the character of Marion Crane’s boyfriend in Psycho (1960). There are also echoes of Psycho created in the casting of Jamie Lee Curtis, who is the daughter of Janet Leigh (and Tony Curtis). Janet Leigh of course played Marion Crane, the original slasher movie victim in Psycho‘s infamous shower scene. There were several sequels:– Halloween II (1981), Halloween 4: The Return of Michael Myers (1988), Halloween 5 (1989), Halloween: The Curse of Michael Myers (1995), Halloween H20: Twenty Years Later (1998) and Halloween: Resurrection (2002). Numerically, Halloween III: Season of the Witch (1982) is part of the series and is produced by John Carpenter but is otherwise an unrelated film about Druidic sorcery and killer androids. It was an entry where Carpenter was trying to take the series in the interesting direction of using the Halloween name as a generic title for a series of horror films. However, this failed, Carpenter sold out interest in the series and subsequent entries returned to the formulaic exploits of Michael Myers. None of the sequels come anywhere near generating the eerie suspense that Halloween does and merely offer up more blood and novelty killing set-pieces, which is why this remains a classic and they are just hackwork. Amid the fad for remakes of 1970s/80s horror films during the 2000s, John Carpenter’s films have drawn much attention and Rob Zombie conducted a remake with Halloween (2007) and followed it with a sequel Halloween II (2009). Halloween (2018) was a further sequel to the original from Blumhouse, featuring a return performance from Jamie Lee Curtis. Halloween was parodied in The Funhouse (1981), Student Bodies (1981), Saturday the 14th (1982), Transylvania Twist (1988), Scream (1996) and Stan Helsing: A Parody (2009). John Carpenter’s other genre films are:– Dark Star (1974); the urban siege film Assault on Precinct 13 (1976); the stalker psycho-thriller Someone’s Watching Me (tv movie, 1978); the ghost story The Fog (1980); the sf action film Escape from New York (1981); the remake of The Thing (1982); the Stephen King killer car adaptation Christine (1983); the alien visitor effort Starman (1984); the Hong Kong-styled martial arts fantasy Big Trouble in Little China (1986); Prince of Darkness (1987), an interesting conceptual blend of quantum physics and religion; the alien takeover film They Live (1988); Memoirs of an Invisible Man (1992); the horror anthology Body Bags (tv movie, 1993), which Carpenter also hosted; the H.P. Lovecraft homage In the Mouth of Madness (1995); the remake of Village of the Damned (1995); Escape from L.A. (1996); the vampire hunter film Vampires (1998); the sf film Ghosts of Mars (2001); and the haunted asylum film The Ward (2010). Carpenter has also written the screenplays for the psychic thriller Eyes of Laura Mars (1978), Halloween II (1981), the hi-tech thriller Black Moon Rising (1985) and the killer snake tv movie Silent Predators (1999), as well as produced Halloween II, Halloween III: Season of the Witch (1982), the time-travel film The Philadelphia Experiment (1984), Vampires: Los Muertos (2002), the remake of The Fog (2005) and the reboot of Halloween (2018). Following Halloween, Jamie Lee Curtis was quickly typecast as a slasher movie heroine, appearing also in Prom Night (1980), Terror Train (1980), Roadgames (1981) and Halloween II before deciding to bid such roles goodbye. She has subsequently appeared in the psycho-thrillers Blue Steel (1990) and Mother’s Boys (1994), as well as returned to the fold for Halloween H20: Twenty Years Later (1998), before killing the character off in Halloween: Resurrection (2002) and then returning in Halloween (2018).